According to Madrid-based newspaper Marca, Paul Pogba wants to leave Manchester United for Real Madrid. Both the midfielder and his agent, Mino Raiola, reportedly believe the team that best suits him is none other than Real Madrid which suggests they probably haven’t watched a lot of Spanish football this season. 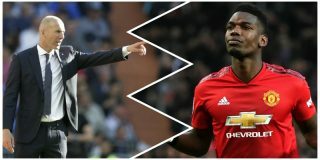 Marca reporter José Félix Díaz claims Pogba is serious about a summer exit with a view of joining Madrid, with Raiola working to make the deal happen. Zinedine Zidane, who has recently returned to Madrid as manager, will be looking to revamp his squad this summer as an overhaul is needed at this point. The Spanish giants are said to be interested in Chelsea’s Eden Hazard too. On Wednesday, Pogba said it would be a ‘dream’ for any player to play for Madrid, but made sure to state his happiness at Manchester United. “Like I’ve always said, Real Madrid is a dream for anyone. It’s one of the biggest clubs in the world,” Pogba said, as quoted by Sky Sports. “There is also Zidane as a coach and it’s a dream for anybody who likes football. We took those quotes with a pinch of salt. Every football in the world dreams of playing for Real Madrid and he carefully states that he is happy at United. Pogba refusing to answer a question on Madrid would only add fuel to the fire and spark more transfer gossip.